If you’re a consumer looking for a new car, a new pair of jeans or a new shade of lipstick, who are you going to look to for a recommendation? A: Brands that are trying to sell you their latest and greatest? Or, B: Someone who has already purchased the item and is raving about it on social media? If you answered B, you’re right. The statistics are in, and a growing number of people say they trust consumers’ opinions and reviews more than they trust messaging from the brand that’s pushing the product. According to one 2017 survey, when 1,000 shoppers were surveyed about the online influences that affect their purchasing decision, 90 percent of them said “user-generated content” had the most impact. So how can you capture some UGC-driven sales? I’ve got two words for you: Instagram giveaways. An Instagram giveaway is simple. You ask people to post a photo to Instagram and include your unique hashtag in the caption. That’s all it takes for them to be entered to win your prize. You can also easily add a form to your giveaway, making it possible for you to collect email addresses. In this post I’ll share some great examples of Instagram giveaways I hope will inspire you. No matter how big or small your business, you can learn a few things from the giveaways brands like House of Switzerland, Starbucks, Millie’s Wolfheart USA and Williams-Sonoma have hosted. Retailer Williams-Sonoma recently hosted an Instagram giveaway. The prize was a set of All Clad cookware. They asked people to share a photo of a meal they’d prepared and tag it with #allcladcontest. 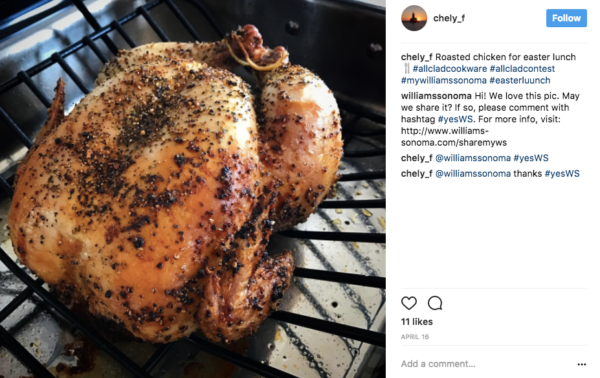 When Williams-Sonoma saw images they liked, they asked for permission to use them. 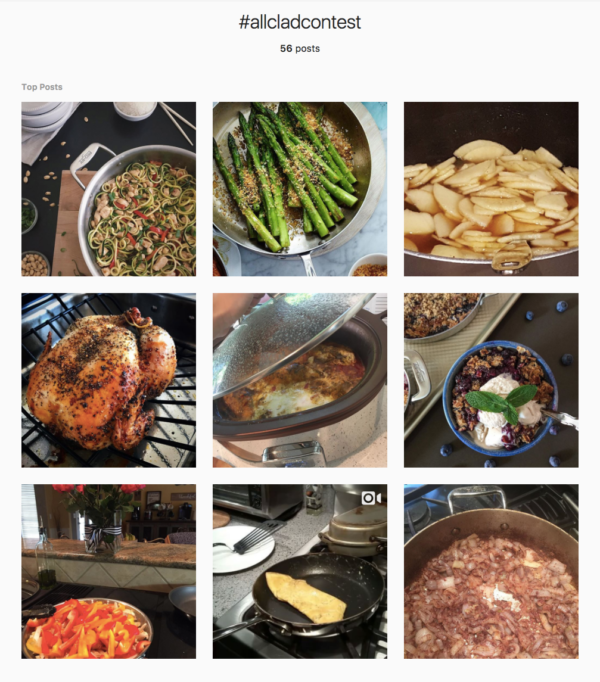 This is a sampling of the UGC Williams-Sonoma collected with their #allcladcontest. 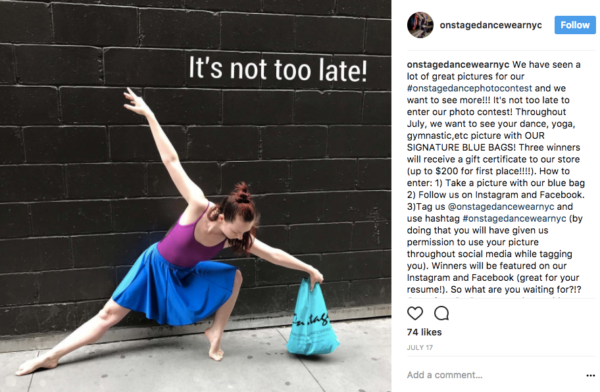 Let’s move on to a few tips that’ll help you create an Instagram giveaway and build a valuable collection of content to include in future marketing. 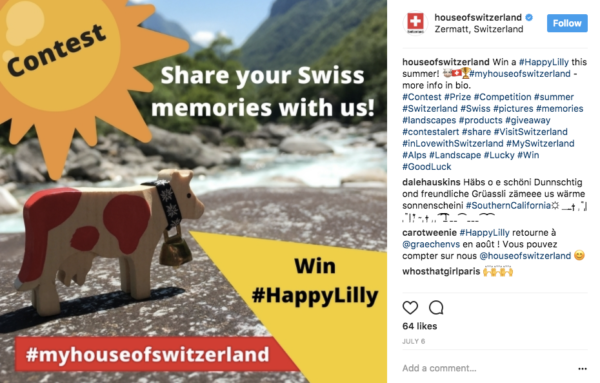 The prize for House of Switzerland’s Instagram giveaway was one of their tiny “Happy Lilly” toys. I’m not sure what House of Switzerland’s goals were, but if I had to guess I’d say “boost engagement” and “find and develop brand advocates” were at the top of the list. 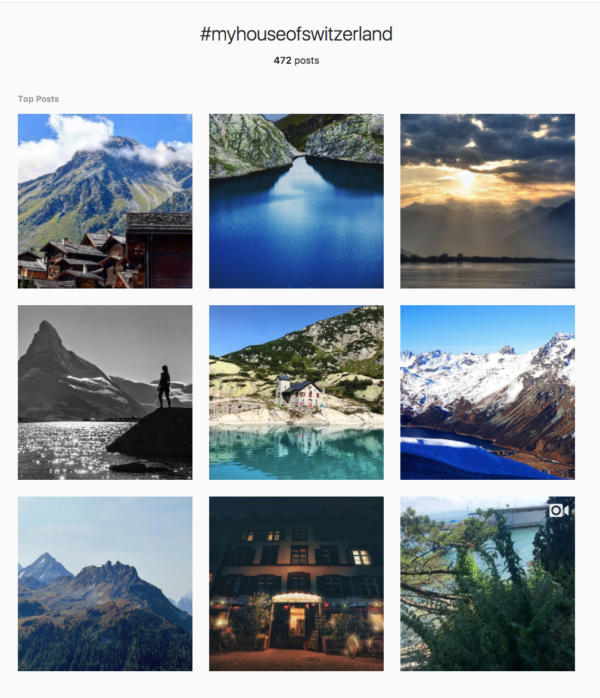 During a nine-week contest, House of Switzerland awarded a prize to a person who posted a photo of their travels in Switzerland. 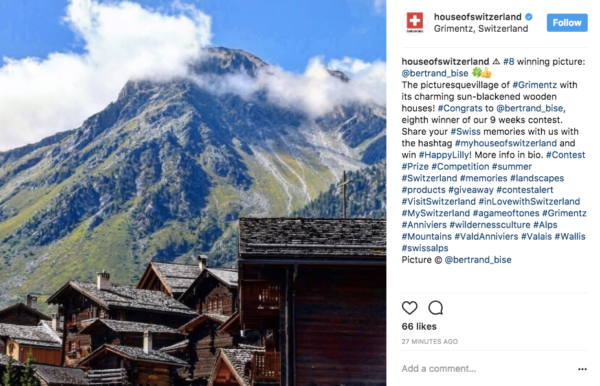 With their Instagram contest, House of Switzerland collected hundreds of gorgeous travel photos that they could decide to use on their social channels, on their website and even in print ads. 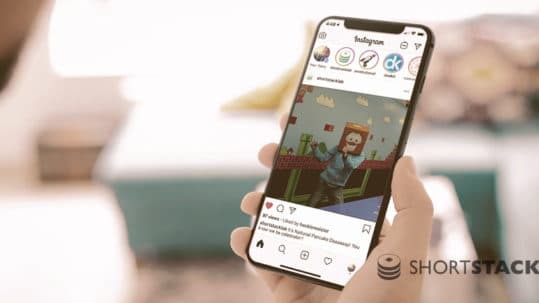 One of the best reasons to use an Instagram giveaway to collect UGC is to build a library of images (and video) to use on various marketing channels. 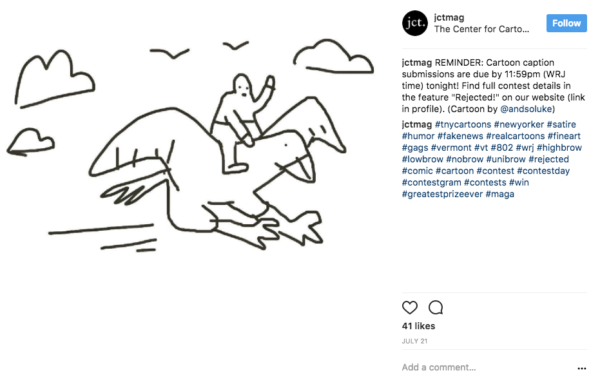 User-generated hashtag contests are especially popular on Instagram and Twitter, but you can also promote them on Facebook and YouTube, among other platforms. 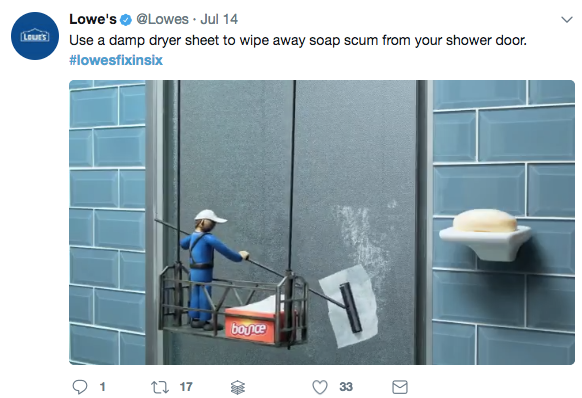 Don’t forget: Once the contest ends, look at ways to use the UGC collected in your advertising and other marketing. Why? According to Shopify, when stores include UGC in their advertising, click-through rates are four times higher, and cost acquisition and CPC drop by half (!). 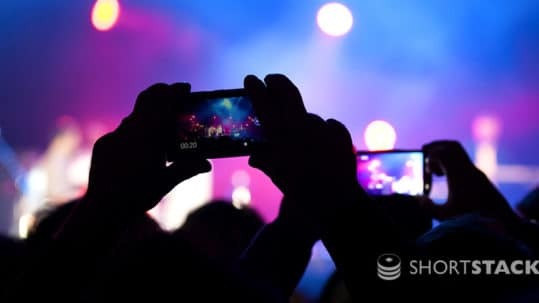 What’s more, the more engagement a post gets, in the form of likes and comments, the higher platforms like Instagram prioritize the photos and videos in their feed, making it easier for your posts to be viewed by more people. Offering a prize or other incentive (like a discount) is an easy way to attract people to your giveaway and even to turn passive participants into active ones. 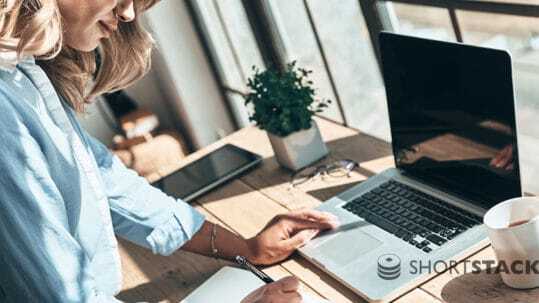 You may consider offering a combination of prizes, such as a free trial of your service or one of your popular products, and also feature the winner’s submission on your website. That way, the winner is rewarded with a tangible prize and also incentivized to share their winnings on their social networks, bringing more exposure to your business. Giving away a “big” prize, like an iPad or cash might bring you lots of entries and followers, and even engagement — at least in the short term. But if your goal is to build a solid customer base, you’re better off designing your Instagram giveaway around a prize that’s relevant to your business. 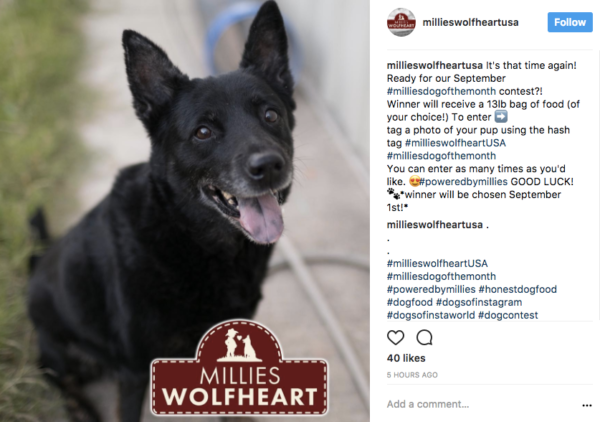 In this example, pet food brand Millie’s Wolfheart is offering a bag of dog food as the prize for their #milliesdogofthemonth contest. MIllies Wolfheart USA hosts a contest every month. With their Instagram giveaway, Millie’s Wolfheart has collected dozens of adorable dog photos tagged by their customers. 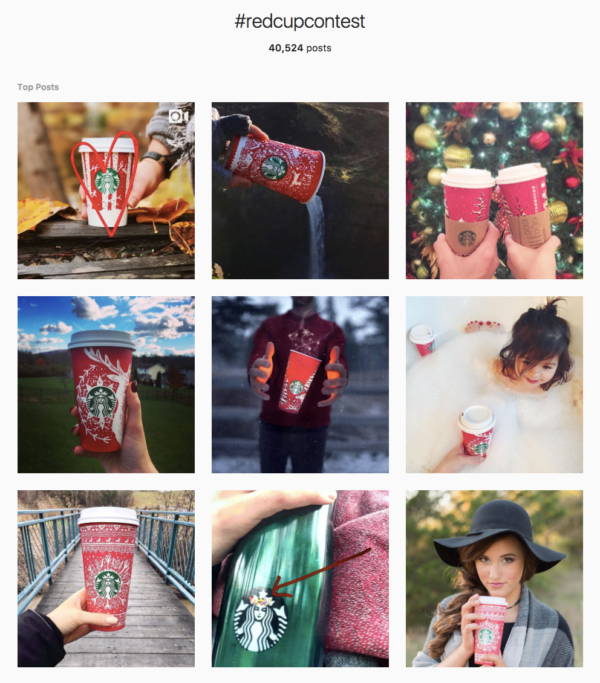 For last winter’s red cup contest — the prize was a $500 gift card — they asked people to post their red-cup creations and Starbucks’ post announcing the contest winners got 309K views. A photo or video that shows the user wearing or using your product. 2. A post that asks for a caption for a drawing or painting or costume related to your brand. 3. A photo contest that asks customers to share how they use your product. 4. A short video contest that ask customers to share alternate uses for your product. The proliferation of user-generated content on social media can be hard for brands to monitor. Do you even know how many people are talking about your brand using certain hashtags? If you’re hosting a giveaway and using hashtags to collect UGC, you should always post rules that alert people as to how and where you may eventually use their posts. 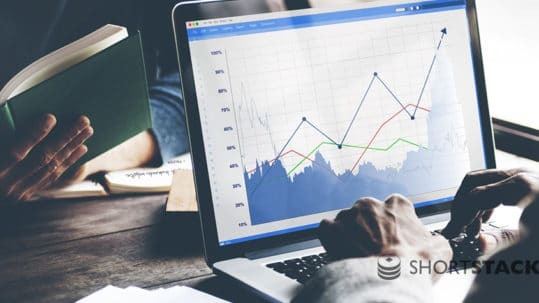 But even if you’re not giving anything away, there are tools that will help you monitor content that includes specific hashtags so you can listen in on what people are saying and even collect the content in a database. From there, you can ask for permission to feature posts you’d like to use on your own channels and even in traditional marketing efforts, like print advertising. 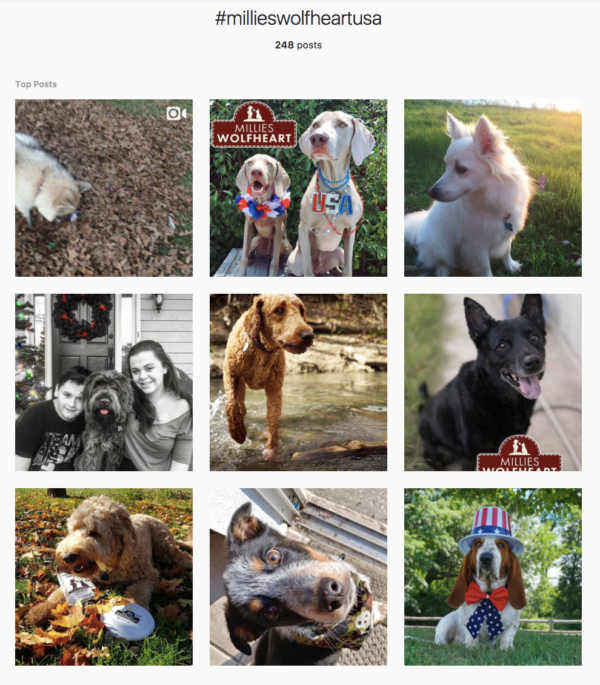 Consider what Nylabone, the company that makes chew toys and edible treats for dogs, recently discovered: 41,763 images and videos on Instagram with their unique hashtag: #nylabone! 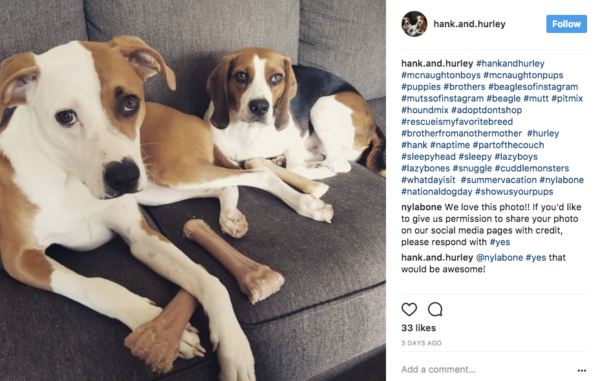 Nylabone uses ShortStack to collect all the content people tag with #nylabone, and when they see a post they like, they ask the person who posted the image for permission to use it on the company’s social channels. 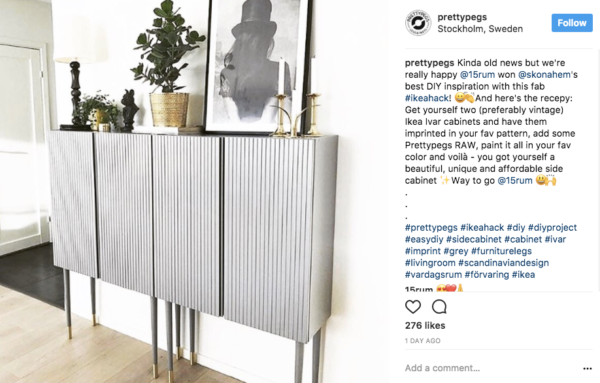 These tips should help you use an Instagram giveaway to collect high-quality UGC you can use to drive more traffic and sales, collect ideas for new products (and new ways to use existing products), communicate better with your customers, and save a lot of money on advertising. 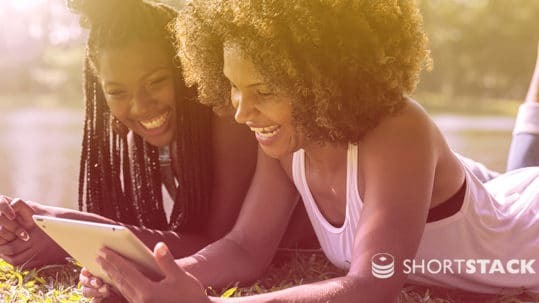 How can ShortStack help your business leverage Instagram ? Just ask!